Manuel Lanzini is in a positive career moment. Two goals at the weekend and a great performance saw him help West Ham beat Everton 3-1, and Argentine newspaper Ole take notice. 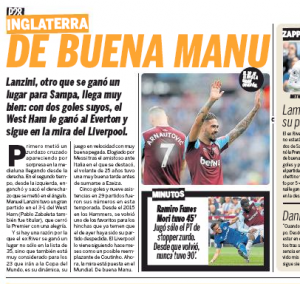 In their Monday edition, Ole go over Lanzini’s good performance and say he may not only be in Argentina’s 35 man pre World Cup squad, but also has a good chance of being in Jorge Sampaoli’s final 23. The player ‘remains in Liverpool’s sights’ according to the article, and it’s stated Jurgen Klopp’s club have been following the West Ham player ‘for months’. Ole don’t lean on anyone else for the transfer interest information, presenting it as their own. Lanzini has been repeatedly linked to Liverpool, and has been presented as a possible Coutinho replacement. For an Argentine audience it’s pointed out Lanzini is a ‘fan favourite’ at West Ham, and that the club’s supporters are worried about him leaving this summer. Getting in that final World Cup squad would benefit any valuation of Lanzini, but it would also make Hammers fans even keener he stays with the club.